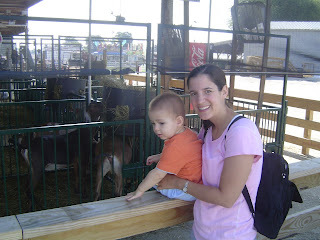 We didn't make it to the Indiana State Fair this year (bummer! 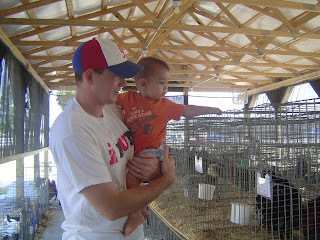 ), but we did spend a quiet Sunday morning at the Bartholomew County Fair. Since we're new to Columbus, it was our first trip to this county's fair. We were not disappointed. It was quiet that morning (the midway wasn't open, and neither were the food booths... so no elephant ears for us!) I'm sure we'll pick a different time to go next year so that we can experience all the gluttony, sights and sounds a county fair offers, but this was actually kind of nice too. 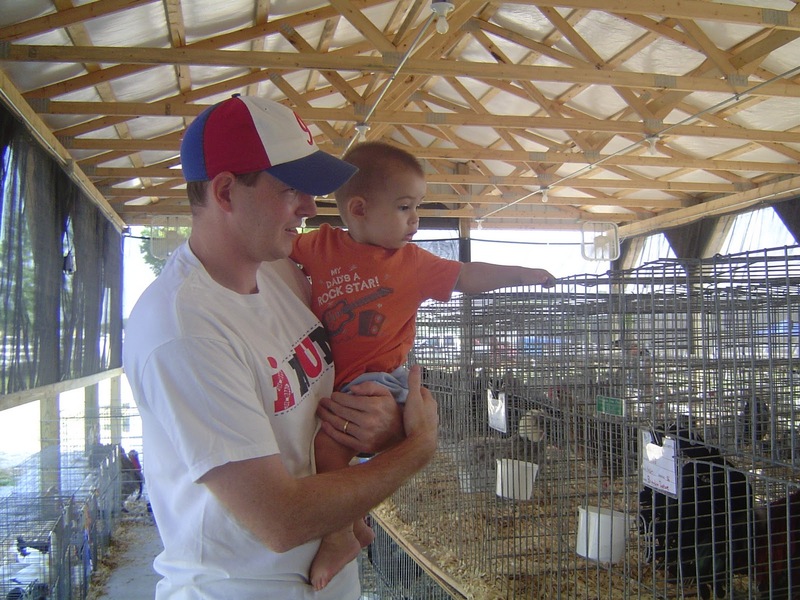 We focused instead on spending lots of time in the animal barns and watching 4-H kids show off their horses. Afterall, that's what a fair is all about, before we got all hung up in deep frying butter and oreos. So if the bigger state fairs overwhelm you, or are too far from home, definitely put your local fair on your calendar for next summer. It's a great outing for little kids--they can get up close and personal with the animals, and you won't be rushed by masses of people. 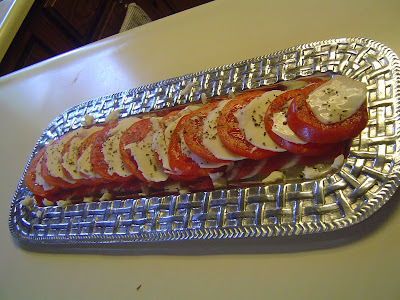 This post is a part of Spotlight Thursday at Trekaroo. I've recently been reading some chatter about the pros and cons of traveling with kids, why/if you should do it, etc. Some of the naysayers suggest that because kids are often too young to remember the experiences, it is therefore just not worth the hassle. Leave them at home with grandma or don't travel again until they're old and grown and out of the house. See that smile? We don't get that exact smile at home, playing with the same toys, looking at the same boring walls. We do get that smile when we're out and about doing interesting things. Close to home. Far from home. Doesn't matter to him. Or to us. I know he's 15 months old. I know he won't remember this when he's 20. Or even tomorrow, for that matter. But you know what? He knows it in the moment. And he knows he's happy. And that's why we bring him along on most of our adventures. I'll be up front with this... I'm not really a gadget person, but I'm all over any device/contraption/gadget/robot that allows us to be more mobile with our little arrow. So this spring, while Facebook stalking (you all know you do it, too), I ran across a photo a friend posted that featured her little arrow in the strangest looking bike seat I've ever seen. And it got me thinking... bike riding? Bike riding with our little arrow? I hadn't even thought about it as an option. I confessed to stalking this friend, and she offered up that they love their bike seat and highly recommended it. It is called an iBert . I know, I know. It looks terribly uncomfortable (for the arrow and his dad, right?) But it's not, I promise. I can especially promise now, because since hubbie's out of town on business, I've been biking all over town with my 23 lb arrow strapped to my handle bars. 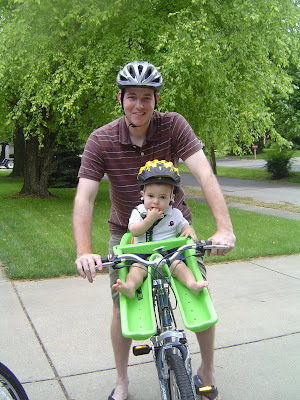 We move a little slower than when dad's got him on his bike, but we manage just fine. And you know who loves it more than his parents? The arrow. You've never seen pure joy until you see our arrow on a bike ride. We can be out for over an hour, and not the slightest hint of a whine. In the words of Dr. Seuss, oh the places we will go on our bikes! 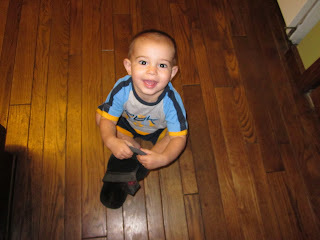 This post is a part of Things I Love Thursday over at Diaper Diaries. You can see more things parents love by visiting. In case you were wondering, I'm a blogger that can only dream of the day that someone might give me something because of this blog for free. So yes, I paid for the iBert myself, and no, I'm not giving one away. One can wish though, right? However, if you are interested in purchasing an iBert for yourself, you can do so at Amazon.com through this link . A small portion of the sale will come back to me and support this blog. Here a couple of gems I ran across this week. I ran across this contest involving best travel songs. Voting appears to be over, but if you're looking for some great road tripping songs to add to your collection, this is a great list. You can even hear little snippets of each song. My favorite travel song will always be Sweet Home Alabama. You just can't beat a song that tells you in the very first line to "turn it up." Gets me every time. Do you have a favorite road trip song? Did it make the list? Leave me a comment. And finally, this hilarious video from the HaveBabyWillTravel site had me in stitches. It's must-see tv for any mom. My favorite part is when he decides he needs another swig off that bottle. Good man. This post is a part of Saturday Stumbles at It's Come 2 This. Check out what others have stumbled upon this week. Yesterday I gave a sneak peak into last weekend's trip to Brown County State Park. I decided there's no day like today to finish that thought. We love Brown County. Its a great spot for a family weekend away. The park itself has a great lodge, complete with brand new indoor pool/waterpark. We are already planning a few cold weather trips to the pool this fall/winter. They also have a nice campground and family cabins available for rent. If you want to stay someplace a little more spacious, there are a gazillion cabins and cottages available to rent all over the area. Hills O'Brown manages many of them. The town (Nashville) is so quaint and fun. Cute little shops, plenty of spots to grab a treat. It gets really busy on nice weekends, and insanely busy in the fall, so be warned. 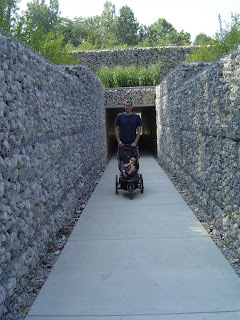 It's also not very stroller-friendly, although we manage to navigate it ok with our jogging stroller. You're also only about 20 minutes to Bloomington (home of Indiana University) or our hometown, Columbus (home of world-famous architecture). But mostly we love Brown County for the hiking. 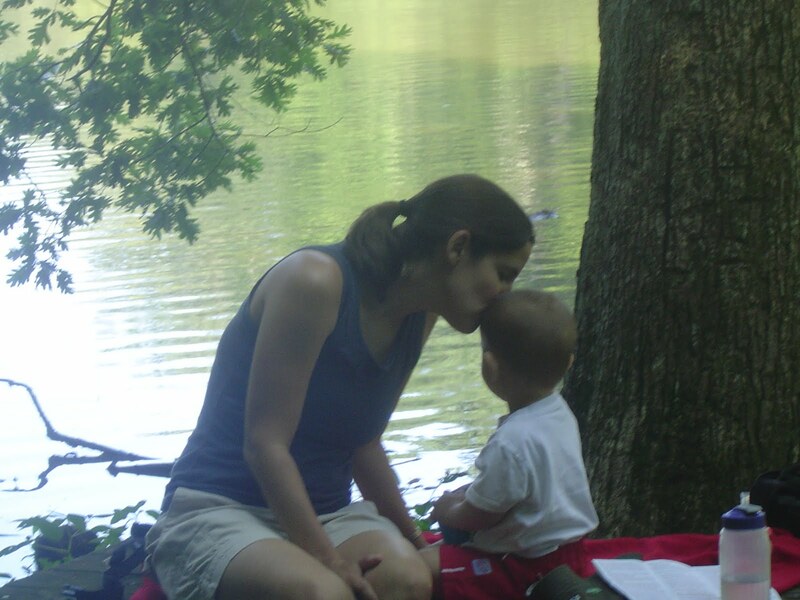 We've done most of the trails there with our little arrow, but our favorite and most kid-friendly is the trail around Ogle Lake (Trail 7). Relatively flat compared to the other trails (which is nice when there's a 22 lber strapped to your back) and gorgeous views of the water the entire way. A little snapshot of paradise in our own backyard. If you're a horse lover, check out Trail 3, which you can pick up near the Saddle Barn and visit the beautiful horses. Live in Indiana? 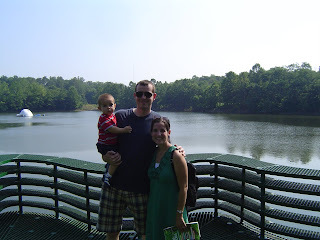 We love the state parks and have invested in a yearly pass ($35 for in-state residents) and therefore we don't pay the gate fee every time we visit. It has encouraged us to visit the parks more and get good use out of our pass. This post is a part of Photo Friday at DeliciousBaby. Go see where everyone else has been going. Every night I witness just about the cutest thing you could ever imagine. 5:30 rolls around, and suddenly the garage door opens. Our little arrow hears this, and immediately begins his erratic "I'm so excited and I just can't hide it" jiggling dance. Then in walks Dad. "Bup. Bup. Bup!!!" 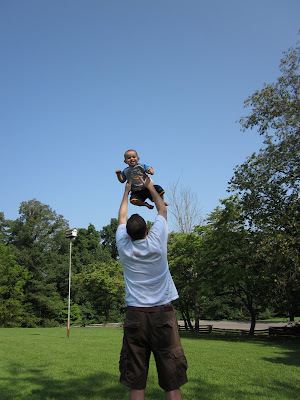 It is our little arrow's way of asking to be tossed in the air (bup=up). Fortunately, there's a travel version of the Bup game. We take it with us everywhere we go. 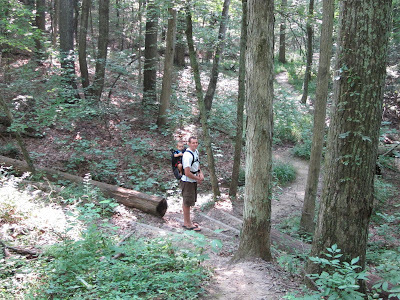 Like this weekend at the Brown County State Park, one of Indiana's loveliest places (I'm sure I'll be writing something about all our fun hikes there soon.) For now, you get this sneak peak at both the Bup game and the park. Today we're celebrating this everyday fun we have because Dad leaves us for two and a half weeks in China tomorrow. Sad for us, happy he gets to take such an amazing adventure. Besides, there will be plenty of Bups to go around when he gets back. 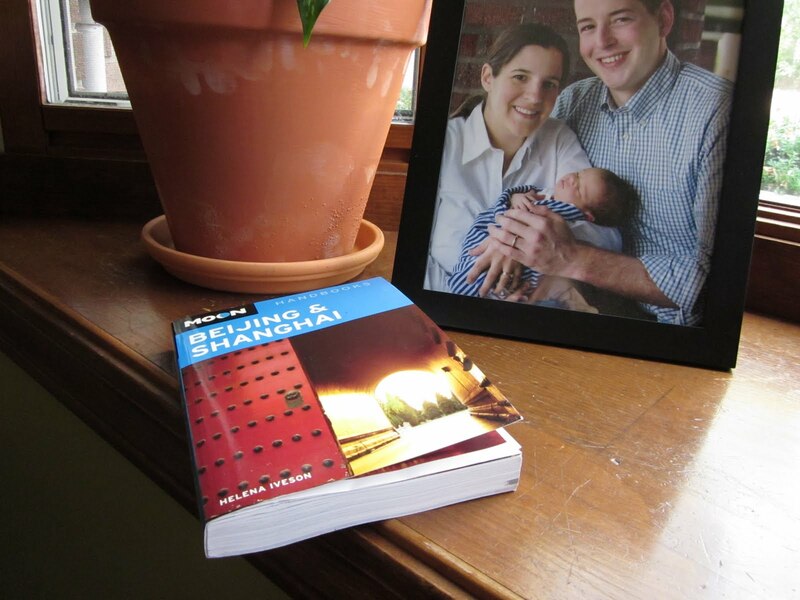 It's also a part of Trekaroo's Spotlight Thursday. Go check out all the other fun adventures (everyday and otherwise). Outdoor concerts in the park are one of summer's simplest pleasures--so bring your little ones along! When our little arrow was about 4 months old, he attended his first concert--one of his parents' favorite bands, Rev. Peyton's Big Damn Band. And as if that wasn't enough fun to pack into one outing, it was a part of the Rib America Festival held in downtown Indy each year. (Meaning we stuffed ourselves silly eating BBQ nachos and pulled pork sandwiches while we rocked... I'm drooling like a teething baby just thinking about it!) This year, it's scheduled for Labor Day weekend (Sept. 3-6), so if you're in the area, check it out. A few pieces of advice? 1) Choose concerts that are scheduled for big, outdoor spaces. Not only will this mean you can park yourselves far enough away from the loud speakers to keep your little arrows' ear drums from busting open, but your stroller, blanket and various other pieces of baby gear won't bother anyone either. 2) I wish we would have taken along our Baby Bjorn (or baby carrier of your choice). 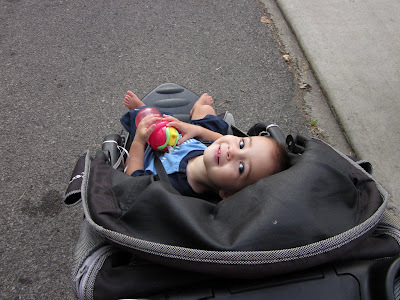 Our little arrow wanted to sway and jam to the music just like us (and people watch), instead of staying confined to his stroller, which meant we had to hold him quite a bit. 3) Make sure to pack sunscreen, hat, etc. The shady spots usually go pretty quickly, so be prepared. Since then, we've attended a few other live shows as a family that I'm sure I'll be posting about soon. Rock on, babies. 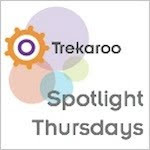 This post is a part of Trekaroo's Spotlight Thursdays. See what others are doing with their kids this week! Sometimes I forget those times, now that my son is down to one nap and we seem to be constantly on the go, running errands, meeting friends, visiting family, or just plain having fun. But there was a day when I never thought I'd leave the house after giving birth. 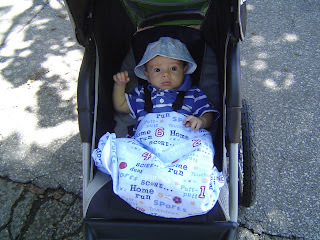 In those first couple of months, we tackled a few walks around the neighborhood, quick visits to the grandparents, and maybe even a dash to the grocery store. At around the three-month mark, I was beginning to think my life might never reach beyond my living room. One Saturday morning my husband and I were daydreaming about Saturdays past... leisurely strolls around downtown Indy; lunch out somewhere; drinks/live music in the evenings. I don't know what got into us, but we finally decided to get brave and GET OUT. We got the little arrow all tucked into his stroller and off we went, doing what we've always done best together: exploring! We mostly just walked, ducked in and out of a few stores, grabbed a coffee, and even ate a meal out. I was still too nervous to sit in a restaurant with him (heaven forbid he cry in public... I've since gotten over that! ), but we grabbed a sandwich at a deli and ate it in a nearby park. When we got back home a couple hours later, just in time for a feeding, my husband and I were beaming from ear to ear. We did it. Life would be fun again, we just knew it. That simple little trip out was like a breakthrough for us. It was the start of many fabulous adventures to come, kid in tow. And I honestly think that while bringing along baby changed our outings drastically, it has made them that much more fun. 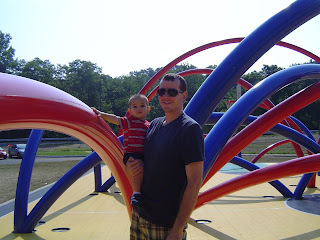 The sense of accomplishment you feel when you've successfully had a fun time out of the house, kid in tow? Indescribable. So my advice to new moms? I get the whole "keep newborn away from germs" those first few weeks. But find a way to get out while still keeping your little arrow healthy. Need some ideas? 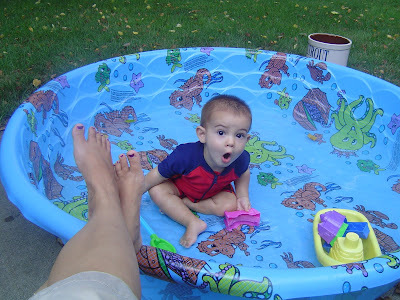 I love the Rookie Moms blog (wish I had known about it in those dark, lonely days! ), and they have lots of great ideas and bloggers that will inspire you with their stories. And I promise, life doesn't really return to normal, but it does return to being fun again!